The ComplyRight™ FMLA Administration System gives you all the FMLA forms, guidelines and information you need to effectively manage FMLA requests according to FMLA regulations. 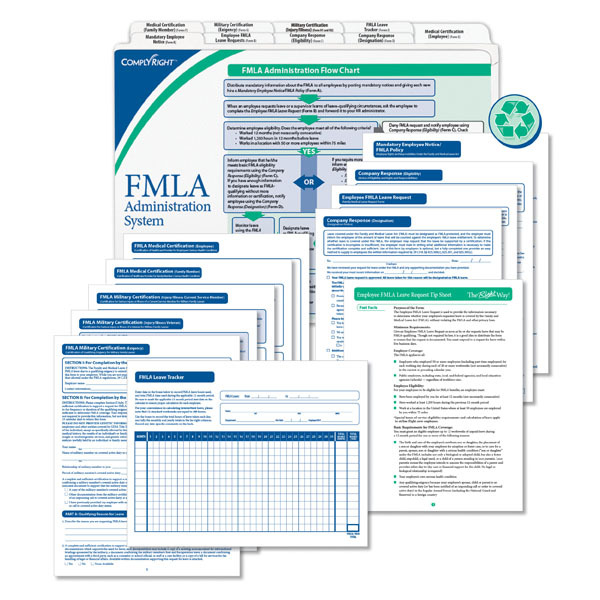 With clear instructions and easy-to-use forms, the system simplifies your FMLA responsibilities. 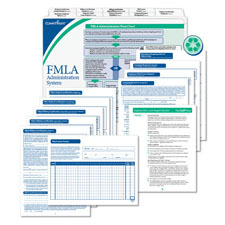 Organizer with FMLA Flow Chart (1) - Stores all components in an organizer that easily fits in any standard-sized file drawer, and features an FMLA-administration flowchart, clearly outlining each step of managing FMLA requests, to make following FMLA guidelines easier. Mandatory Employee Notice (10)- - Provides consistent and accurate information to employees as required by new regulations. Includes explanation of reasons for taking leave and employee responsibilities, rights and benefits. Employee FMLA Leave Request Form (10) -- Gathers the necessary information to determine an employee’s FMLA eligibility without violating privacy laws. Company Response (Eligibility) (10) -- Informs employees of their FMLA eligibility or non-eligibility, as required by law. Company Response (Designation) (10)- - Indicates whether an employee’s request is considered FMLA leave, as required by law. Medical Certification (Employee) (10)- - Completed by a healthcare provider to verify a serious health condition. Medical Certification (Family Member) (10) -- Completed by a healthcare provider to verify employee’s need to care for a family member with a serious health condition. Military Certification (Exigency) (10) -- Verifies employee’s need for FMLA leave due to a qualifying exigency. Military Certification (Injury/Illness) (10) -- Verifies need to care for a covered service member/veteran with a serious injury or illness. FMLA Leave Tracker (10) -- Helps you monitor the hours of an employee’s leave during a 12-month period. Tip sheet guides you through calculating employee leave. Note: This product complies with the newly expanded FMLA rules effective 3/8/13.